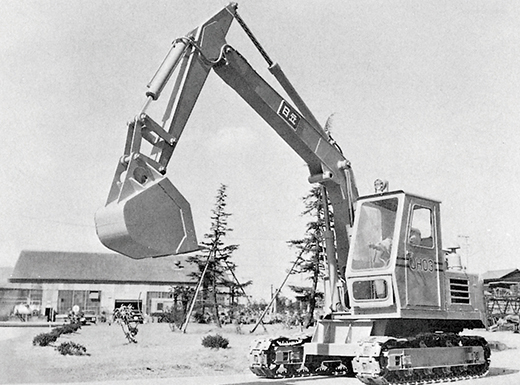 HCM’s roots can be traced back to 1950 when Hitachi, Ltd. began the full-scale supply of mechanical excavators to markets. 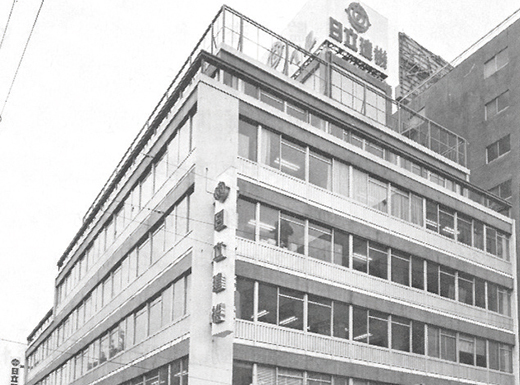 Later, HCM was spun off from Hitachi, Ltd. As an independent company, we worked toward the evolution of construction machinery based on our leading technical capabilities. HCM also established a global service system so that customers can operate their machinery in the best possible condition. 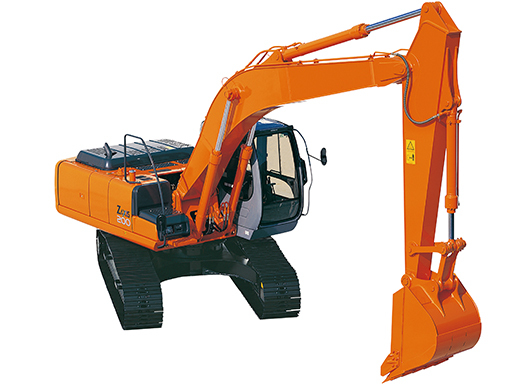 With foreign companies actively entering the market, we developed the first hydraulic excavator made exclusively with Japanese technologies. 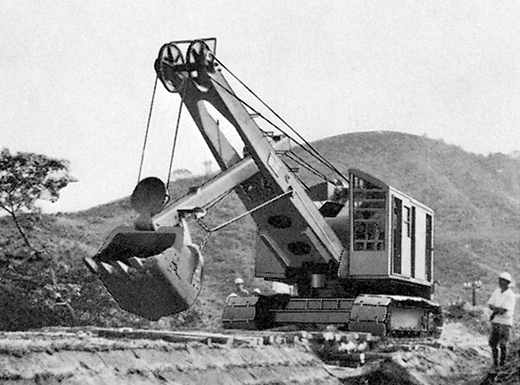 This successfully and greatly expanded the scope for mechanized works and in 1973 demand for hydraulic excavators exceeded 20,000 units. As a result, these machines were rapidly popularized. Establishment of Hitachi Construction Machinery Co. Ltd.
Hitachi Construction Machinery Co., Ltd. was established through amalgamation of Hitachi Construction Machinery Co., Ltd. (manufacturing company) and (former) Hitachi Construction Machinery Co., Ltd., which focused on construction machinery sales and services. The new company was capable of providing integrated services from manufacturing to sales and services. We were the first in the industry to offer an optional satellite communication system for the ZAXIS series of hydraulic excavators. This made us the first to offer the future of information functions as an information-driven e-excavator that can obtain operating information remotely. We began providing ConSite and its next-generation menu of services powered by ICT amid the change in customer focus from not only performance but also to cost reductions throughout the life cycle. 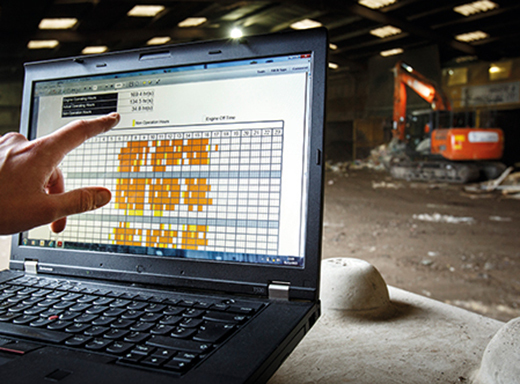 Since then, the number of ConSite contracted machines has reached 82,431 units. 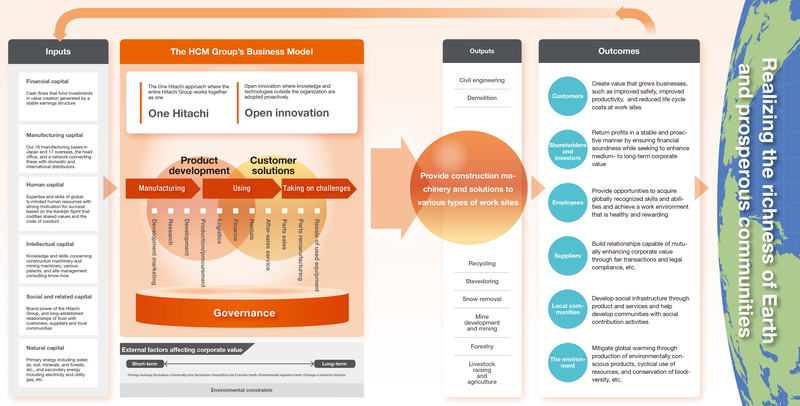 The HCM Group’s value creation process involves supplying products and services in demand from society, growing to become a company desired by society, and sharing the outcomes with stakeholders. The continuous implementation of this process helps to boost management capital and maximize corporate value. We focus our energy on creating a global strategic development marketing system in order to provide the most appropriate products for the needs of specific countries and regions in a timely manner. 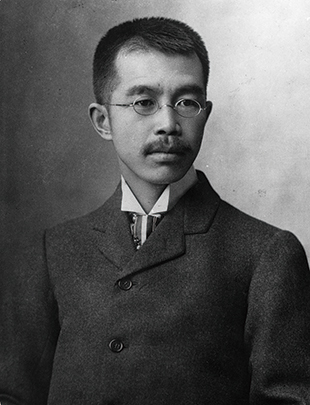 We harness the collective strengths of the Hitachi Group to research technology that is “kind to both human beings and the environment” and “technology that creates an even better environment” as a basis of our medium- to long-term growth. We develop advanced and innovative construction machinery that offers improved reliability, controllability, and comfort, while meeting a broad range of customer needs. We are dedicated to standardizing and improving quality levels while aiming to achieve the concept of Made by Hitachi where all products are made with the same high quality regardless of which of our manufacturing facilities around the world they are made at. We are raising logistics efficiencies by building a logistics system and global supply system powered by IT and our know-how in transporting ultra heavy objects. We offer various financing plans for our products to ensure that they can be employed by customers in a format that meets their needs. We guarantee the high performance and long service life of our products by supplying high quality parts. This reduces customer costs and helps conserve the environment. We collect replacement parts from repair work and restore them to like new condition at our remanufacturing plant. This supports the operation of construction machinery in even the most harshest work sites. We propose the purchase or sale of construction machinery that matches customer needs using our worldwide network and support system.